Visualping is the newest, easiest and most convenient tool to monitor websites changes. Our Chrome app allows to monitor pages with only 1 click directly from the page you wish to monitor. Users receive an email when changes are detected but can also set up a Slack integration for team notifications. What differentiates our app from older ones is the fact that we detect visual changes (hence the name Visualping) not text. Enter the web address of a webpage and Visualping will create a screenshot image of that page. You can create a selection anywhere on that preview using your mouse. After this, select a notification trigger and a checking interval. Enter your email address at the bottom of the page to create your job. You can manage & modify your jobs in your Visualping-Dashboard. Visualping accepts many major Credit-Cards and Bitcoin. The Payment is done through Paypal® or Stripe®. We'll add the credits to your account as soon as the authorization was successful. For your protection, we encrypt your connection and purchase details so that your information is safe and secure. No information will be stored. What is the localized Google Search option? Use this option if you want to localize your Google search, to track your ranking of your and other businesses on the front of Google result page. even if you live in another part of the world. What do the triggers mean? You can choose different triggers when Visualping should send a notification. Tiny means 1% difference, medium means 10% difference and major is 25% difference. Increase trigger: Avoid using “any” change if small areas of the page changes but are not relevant for what you want to track. Adjust Selection: Avoid selecting areas that change frequently like ads, carrousels, twitter counts etc. Increase wait-time: This is the time our servers wait before taking a screenshot. Use this when you see that the screenshot was taken a little too soon. Tick US location Proxy Server: This uses US servers to take the screenshots. Use this when false alerts are created by different languages. Switch to web-compare: Ideal for when page layout frequently changes and the area that is monitored shifts vertically. See web-compare below. Use blocker feature: This blocks elements from being uploaded before taking a snapshot. Use this to remove pop-ups, banners or ads. See blocker below. What is the difference between web- and visual-compare? What is visual compare? Our system takes a snapshot of the area selected and compare it with the snapshot of the same area previously taken. And web-compare? Here you can select an element of the page to be tracked. Our system monitors and compares the HTML code, not pixels. Which one is more reliable? Both systems have the same 100% reliability in detecting changes. Which one generates less false alarms? The web-compare system generates less false positives as is immune to page layout changes. 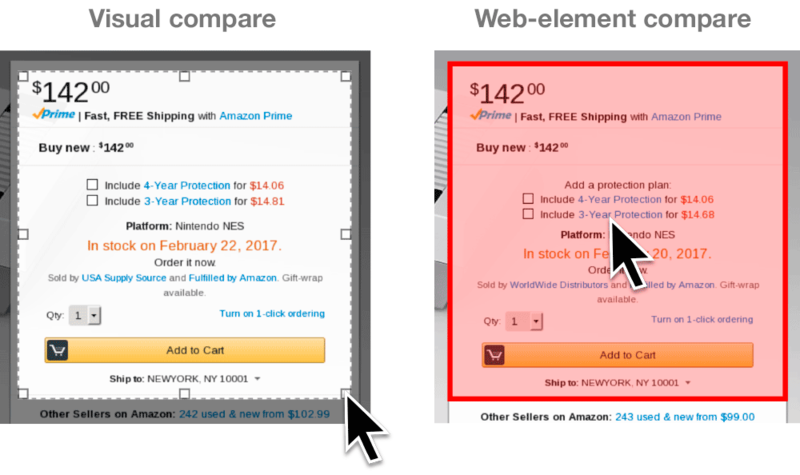 What are the limitations of web-compare? You can’t have a % trigger (“only alert me when 10% of the page changes”) and doesn’t work will non-HTML or PDF's. Which system I chose? It really depends which system creates less false alarms. We recommend starting with web-compare and testing visual compare after. Is the simplest possible change detection alert: It will track the entire page and send you an email alert highlighting what was removed in red and what was added in green. In context highlight: The system will take you to the actual web-page so you can see all the changes in its context. You can access this by clicking ”View Changes” on the email alert. Keyword alerts: The system allows to track only for changes that are removed or added. Use ”,” between keywords to be independently alerted for each keyword. How to use the blocker feature? When to use it? To prevent pop-ups, banners, ads, carousels etc. from loading before taking the screenshot. What is “Selector”? This button allows you to select the element to block directly from a rendering of a page. What is “Preview”? This is to check whether the selection is working. Restart the process if not the case or add the element to block manually. How to use “Add items manually”? Find the element name by opening the page on a bfaq-box rowser (outside Visualping) and right-clicking ”Inspect Element”.